Vendor V1 and Vendor V2 are associated to Plant 1 and 2. Customer C1 and C2 are associated to Plant 1 and 2. Shipping point S1 and S2 are associated to Plant 1 and 2. As per thins link , all the details were maintained and 'M' has been properly updated as well. But when i goto to ME21n to create a STO of type UB, it gives me an error of MEPO 101. i.e. Contract rel. order not allowed in case of intra-co.-code stock transfer. Can some one help and point as to what is the issue. Which config has been missed. Is it that STO cannot be made w.r.t a Contract? we have to make normal PO of type NB and do its outbound delivery from VL10G. and then MIGO . Correct the doc type in PO, it should be "NB" not "UB". 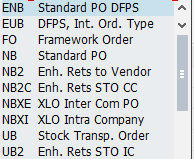 Shouldn't i use Inter company Stock Order type UB. When i try with NB it creates a normal Purchase Order. and then Outbound Delivey approach works. I was trying the UB approach. I couldnt understand the configuration. Note: You Can process inter Company STO by using PO document type UB with Clearing accounts, without delivery, w/o billing, w/o invoice(Mov.types 351 &101). If You are using document type NB then it is only possible with delivery & trigger point is vendor master. In Transaction VK11 Create Condition Record for Condition type PR00 with the sales price if required.